> Polymers VS Glass. A five years comparison. 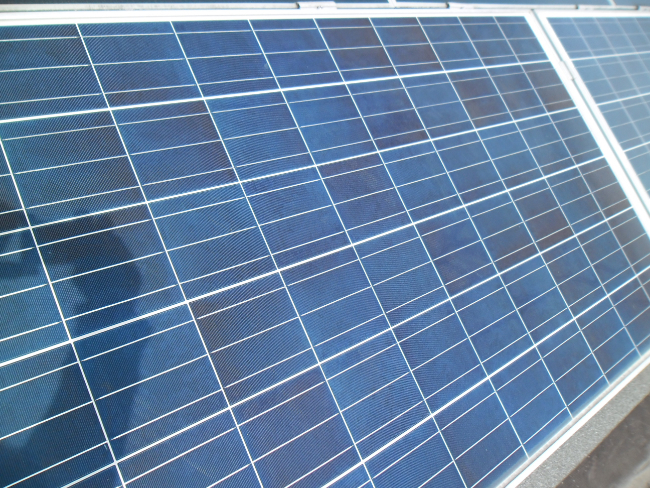 Standard solar panels are rigid, the front protective layer of solar cells is a thick (3-4 mm) tempered ultra-clear glass. This standard solution has been tested for more than 70 years and it is undoubtedly the best to protect cells from weathering and impact, while allowing light to reach them. Flexible panels cannot use glass, obviously, but polymers. Transparent polymeric films have been always thought as a glass replacement, they are lighter and unbreakable but, whatever the chemical choice, polymers cannot be compared to glass when decades of outdoor resistance are considered. A good compromise can be found nonetheless and in the last 20 years several valid flexible panels appeared on the market, mainly based on thin-film technologies for solar cells: Unisolar amorphous silicon and Global Solar CIGS panels are two well known examples. The resistance of thin-film flexible solar panels is actually a controversial subject in the field, but also among rigid glass panels, if compared with the boasted 20-25-30 year warranties, some bad stories of early failure are known. Ten years ago (almost 11 actually) Solbian started a different path: replacing glass with polymers, but on a panel made of crystalline silicon solar cells. Silicon solar cells are far less sensitive to moisture than thin-film solar devices, but they are more fragile and surely not so bendable. 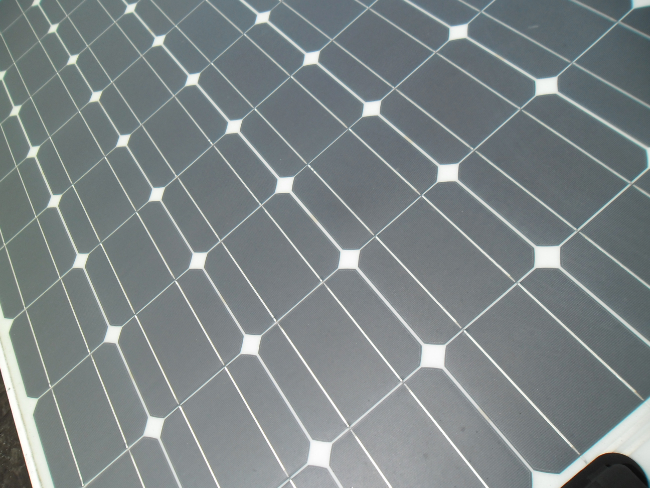 Solbianflex panels were thus conceived as a compromise, aiming to exploit the high efficiency of crystalline silicon, but without targeting a complete flexibility: panels can be flexed but they are not rollable or pliable in small size. That resulted in an acceptable compromise: Solbianflex panels are used in several markets nowadays. Before and after the market introduction Solbianflex solar panels have been tested several times, we obtained IEC certifications in 2011 and repeated the trials in 2015, moreover the feedback from thousands of customers has been giving us confidence in our technology, but a real quantitative comparison with the standard, broadly accepted, glass technology was something important for us. At the beginning of 2013 we had the occasion: a partner company (Ilmed Group) was building a testing solar field to compare different panel technologies and brands. 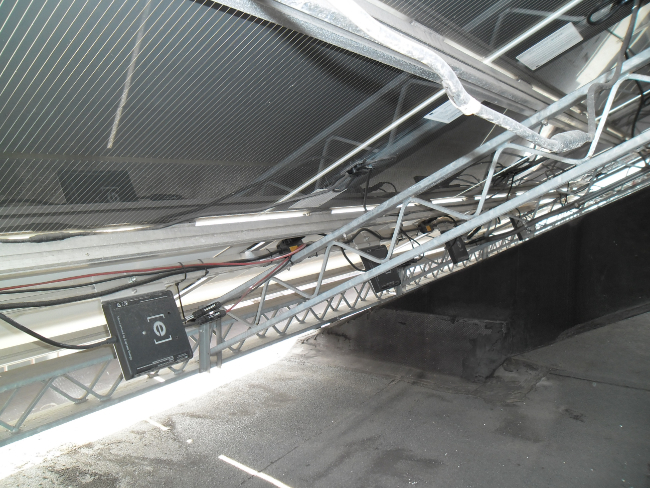 Some of the panels were going to be directly monitored via Enphase Microinvertes and a Solbian panel was added to the group. Five years have passed and now we have the results. The Solbian panel was glued on the top of an inoperative glass panel, it can be easily recognized in the picture because of the frontal Junction Box. Since the initial nominal power is different we will be mainly interested in the relative changes through time, anyway a first initial idea of what happened is given by the full life energy production (Feb 12, 2013 – Mar 24, 2018), as shown in the Enphase control panel. From left to right the panels are as listed above, the Solbianflex CP 220 is the last one. The total energy production, if scaled with the nominal power, is quite in line among the panels. 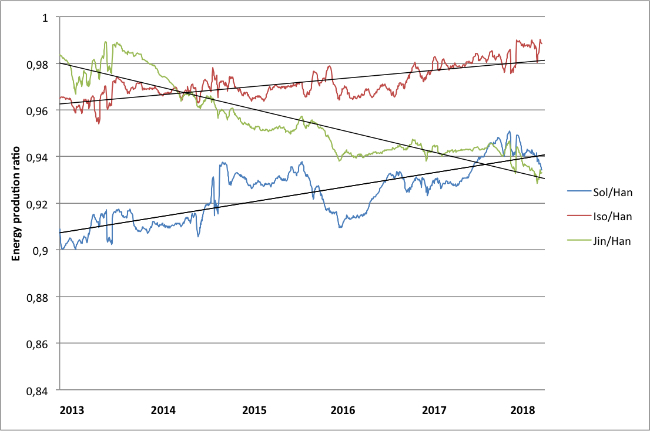 A further interesting step is to look at the same total energy on a different time interval, namely over the last quarter: The Solbian panel is not the less productive anymore. Things are changing. The overall behavior of the four panels is quite similar. It is possible to see the fine details of the different powers, but no hints of larger or lesser degradation of the performance. The initial ratio is obviously related to the different power of the panels. Isofoton is declaring 235W, thus its almost 97% ratio, when compared to Hanwha, is inside the power tolerance, the same for Jinko and Solbian: the latter, with its 220W, is precisely at 91% of the Hanwha power. What is more interesting is the change of ratio with time, while Isofoton and Solbian are decreasing the power gap, the difference between Jinko and Hanwha is increasing, as it was clear from the last data collected (see Fig. 2): since the end of 2017 the Jinko panel is producing less energy than Solbianflex. Furthermore, if we look at the tendency black lines, it appears that the Solbianflex panel is filling the initial gap more quickly, in other words the Solbian panel shows the smaller power degradation with time. 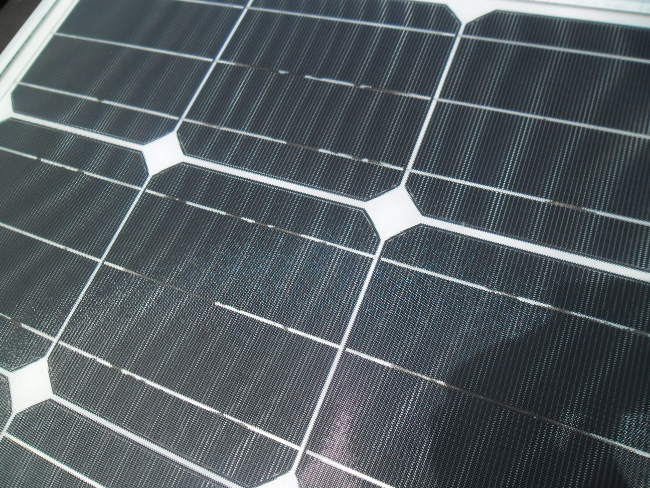 Beyond numbers, the visual inspection of the panels gives us some more hints about the behavior during the years. Solbianflex CP 220 shows the age: the surface is not as glossy as it was right after production, but it retains a good transparency and there is no sign of yellowing. Cells appear in good shape, while the JB, exposed to the sun, has been clearly affected by UV radiation, but -being the panel fully functional- the changes seem restricted to the external surface. Hanwha panel looks OK, confirming its first of the class position. Jinko panel, instead, clearly shows inhomogeneous changes of color, iridescent areas are evident. That could be due to deterioration of the encapsulant (moisture?). The monocrystalline cells of Isofton show clear signs of oxidation on the bus bar. Some moisture entered the panel structure, even if the panel seems not strongly affected by that. 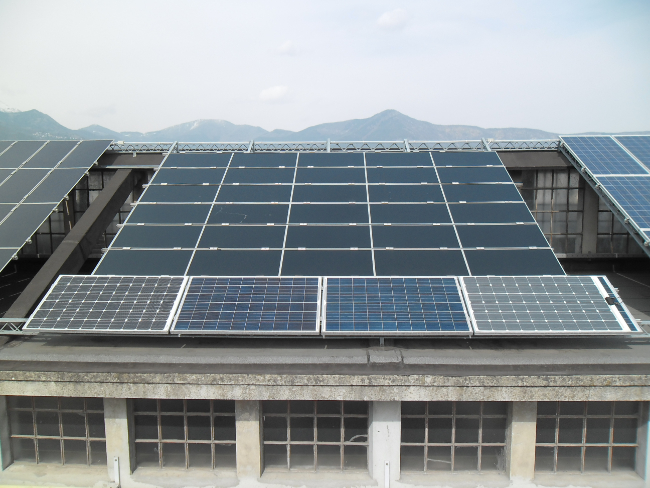 Solbianflex CP 220, a monocrystalline silicon cell panel using an all-polymeric cells encapsulation, has been compared with three similar panels representing the state of the art of standard glass solar panels. 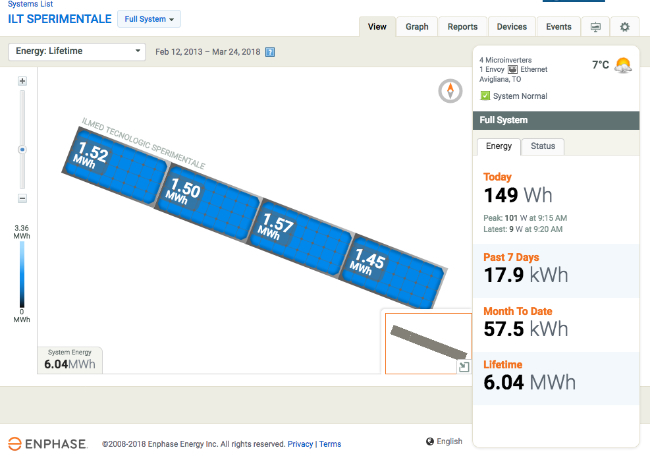 Each panel has been monitored via an Enphase microinverter. 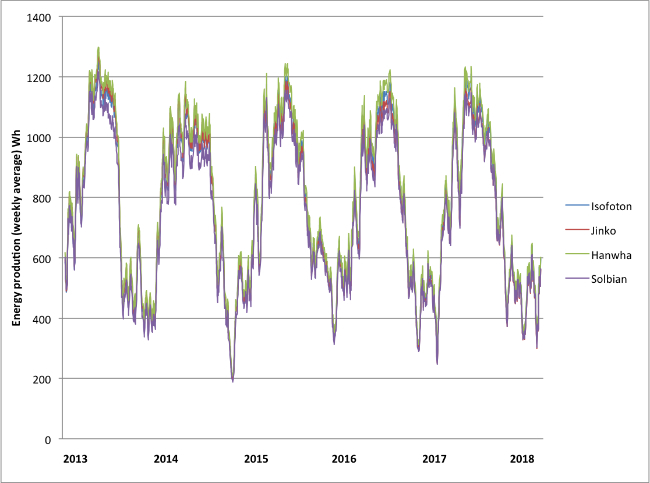 The overall behavior of the panels over a 5 year time span is quite similar, the total energy production is consistent with the initial difference in nominal power. A more detailed analysis shows a performance drift among the panels, with the Hanwha panel leading the group as far as energy production is considered. Isofoton and Solbian panels are slowly closing the gap, namely they are degrading less than Hanwha, while Jinko shows the faster power degradation. Taking into account both the numerical results and the visual inspection over the examined period, Solbian panel shows the best behavior among the tested samples, fully justifying the 5 year warranty on the Solbianflex range.